And will my astute computer whiz readership help me weed them out? Artist Marc Burckhardt, whose paintings I just discovered when I was looking for an original depiction of the great Robert Johnson, pointed out that on his computer, when you click on my blog address at the bottom of my emails, Google ads and banners and bike shops pop up….AUUUGGGHHHH!! They’re not on my computer. Why on his? An hour’s research and a couple of irritable letters from me yielded results from the WordPress people. According to the WordPress support team: “The possible display of ads was disclosed at point 9 in our terms of service when you signed up on http://en.wordpress.com/tos/ “. Yep. I guess I didn’t carefully read my WordPress contract. When did these “Possible ads” first appear? I’ll have to delve further. I may have been unwittingly pelting you all with ads for years. If you’re reading this and know what I mean (do you see banners alla time?) LET ME KNOW. During my run I ruminated, but tried hard to pay attention to the trail since I didn’t have glasses on. My nose already has a big crimp where the half-pound Oakleys pounded their way into the soft bone….Don’t break arm tripping while Being Mad About Having to Pay 30 bux a year to NOT HAVE ADS in your free website. Mark Twain once said something like “if, after a year of writing, you have not been offered pay, it is a sure sign you were meant for chopping wood”. What would he have said about someone paying for the privilege of being read (in the old days that was called vanity press, the kind of publishing that wealthy undertalented writers pursued. As well as the grossly misunderstood like Walt Whitman and Sterne. In the meantime, tour Marc Burckhardt’s original, yet very familiar primitive painting style at his two sites…..This one, and that. 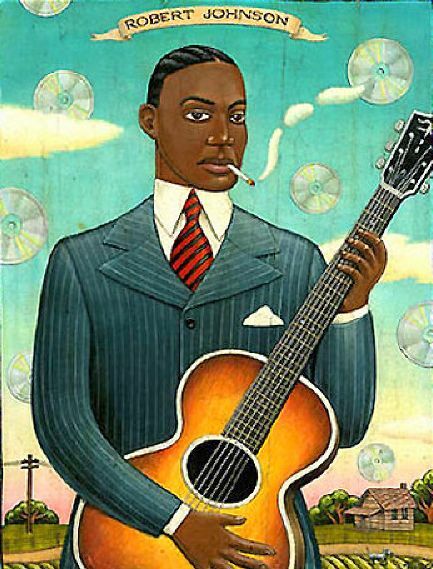 And look for Robert Johnson, he is gloriously insouciant, smoking away with a back drop of shiny CDs. OK then. Thank YOU, Jacquie. This little syzygy moment caused a re-connect with my friend Rob who had a HUGE influence on How I View the World. As do you and your cycling kin up there in Marin, which as far as I can tell is Cycling Heaven. THANKS! I’ve never seen an ad or commercial visiting your page. But, since you mention that it is when someone clicks on the link to your blog from an email of yours, maybe that triggers a commercial in the link code.